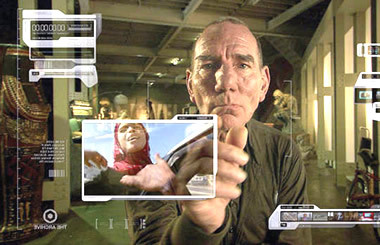 The real star of the film The Age of Stupid is not Pete Postlethwaite (although his authentic air of puzzled disbelief mirrors what many of us feel so strongly these days). It is 81-year-old French mountain guide Fernand Pareau, his tanned face as craggy as his beloved Mont Blanc, which he has climbed 150 times. He shows us the effect of global warming on the ancient glaciers of the Chamonix Valley, which over his lifetime have melted by more than 150 metres, faster all the time. And above his house we see the great highway leading to the St. Bernard tunnel linking France and Italy. Every day 3000 lorries thunder by "taking French potatoes to Italy and bringing them back as mash.... It's madness. Madness. "We have to change lots of things. Change the whole system. And we can’t wait. Because the planet won’t wait. Maybe it’s already too late." Pareau is one of the film’s ‘guides’ to the Age of Stupid. Millionaire businessman Jeh Wadia claims his goal is to abolish poverty in India as he launches a low-cost airline where people can make domestic flights for as little as two rupees. Jamila and Adnan Bayyoud are two Iraqi refugee children living in Jordan, earning a living from recycling discarded shoes. Alvin Duvernay is a former Shell oil man whose own house was destroyed by Hurricane Katrina and who saved more than 100 people from the floods. Layefa Malemi lives in Shell’s most profitable oil region in Nigeria’s Ogoni delta. She guides us through the destruction and repression, poverty and struggle of the Ogoni people. Finally, Piers Guy is an English windfarm developer fighting the anti windfarm lobby in England. Postlethwaite brings it all together, as a man living alone in the devastated world of 2055, looking back at ‘archive’ footage from 2007 and asking: why didn’t we stop climate change when we had the chance? Interspersed with the ‘guides’ documentary films, there is archive and news material, animations and commentary, offering an explanation for the growth of the climate crisis that – unlike Al Gore’s film – recognises the role of reckless and unchecked production of goods and use of energy. Again, unlike Inconvenient Truth, it uses the ‘c’ word – it’s capitalism, stupid! But when it comes to finding solutions, the film does have a problem – like the rest of us! There is a burst of Monbiot-speak, as George urges us to ‘direct action’, but it is not clear with what aim in view. Direct action to try to persuade governments to stop supporting the corporations? Or to put moral pressure on the corporations to stop being capitalist? Or direct action to build the kind of movement that would remove their power to make the decisions that decide the future of life on the planet? That, as someone once said, is the question. If the solution were only as simple as all of us not being stupid any more! Still it would be a very good start – and as with McLibel, Franny Armstrong, Lizzie Gillett and their amazing (shoestring) team have delivered a persuasive, watchable, inspiring film which deserves the widest possible audience. On release across the country. And the Not Stupid team are also looking for people who will organise further screenings.